How do you find the Minecraft toys zombie fans are looking for? Look no further. I think these are my top two favorite Minecraft zombie toys that kids will absolutely love. I love them too! The figurine I like is the Minecraft Core Zombie Action Figure and the plush toy is the 12″ Minecraft Zombie Plush from Jinx. Both are great for birthdays and special events but, the action figure is especially great for those. And I’ll get into that in a little bit! But first, I want to tell you why I personally love these toys. Why do I love the zombie action figure and the zombie plush toy? I played Minecraft a lot throughout college and a lot of the time I played it was spent online with friends. I was actually an admin for a couple of online communities and I had a lot of fun doing that. During that time we fought TONS of zombies. I remember one time we had a little tournament with an obstacle course and a couple of games for us all to play. At the end of the tournament, we had to fight so many enemies and some of which were zombies. But, we were just having fun with it and started bringing in GIANT zombies to fight and run from. That was so surprisingly fun. I remember laughing a lot. Both of these toys remind me of that time and they always puts a smile on my face. I think a lot of Minecraft players will have fond memories too. My favorite part of the figure is the fact that it is designed really well. It’s simple, well made, and they kept it clean. It’s not an overly complicated toy and it’s exactly what I wanted for a Minecraft action figure. There aren’t too many toys, almost none, in fact, that can live up to the awesome standards set by the Minecraft Core Zombie Action Figure. Maybe that’s a little bit over the top but, I really dig this one. It’s fully articulated and he looks just like he does from the game. This classic toy will create hours upon hours of entertainment. And it comes with two very cool accessories just like the Minecraft Steve Action Figure. 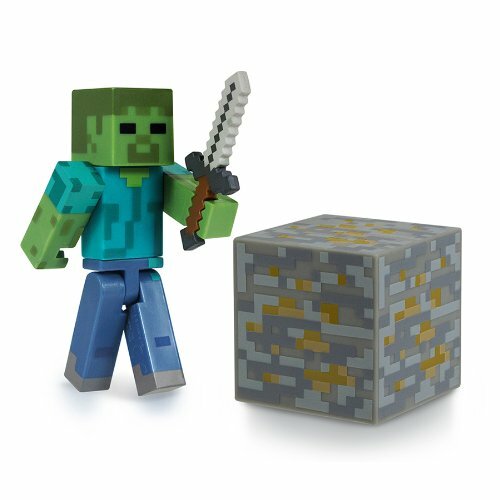 The Minecraft Core Zombie Action Figure comes from the fantastically large and enchanting world of Minecraft. Couldn’t have guessed that from the name of the toy huh? When you spawn into the world you are left alone to fend for yourself against these devilish fiends known as the zombies, among other enemies. They love to come out at night because the light of the sun will roast them alive. That’s why the late hours in this game can be particularly brutal. Already know you want the toy? Buy the Minecraft Zombie Action Figure here! How close is he to the Minecraft Zombie? The cuboid design of Minecraft is what sets up the game as an instant classic that anyone will recognize. That’s why I fell in love with its charm. And this Zombie action figure lends itself to that style very well. In the game, zombies are life size and can be very intimidating but, this little guy here is pretty small. I would describe him as a smaller figure. Not quite mini, but small. He’s about 3 inches tall. Which I think is a great size based on the amount of articulation and the style he comes in. Besides, we don’t need any more huge toys taking up tons of space. Am I right? While the zombie action figure here doesn’t have the most articulation (movable joints) in a figure out there, I believe it is more than fair considering it’s a Minecraft toy. They aren’t known for their ability to bend in realistic ways. And besides, I was so enthralled with his wonderful cuboid look and great accessories that I didn’t even notice that he doesn’t have features like ball joints. They do however have ball sockets so they are easy to pop back in if the arms come off. He just doesn’t have a wide range of motion. So, this zombie is exactly like he is in-game. I would consider that a plus. Fun display ideas and What does the zombie do? I know, I know, I must be crazy for telling you how to play with an action figure. But please, hear me out. This is the way that I connect with a figure and I’m sure kids will feel the same. One of the key features of an action figure for me is the way you can play with it. I like to set up little scenarios to place my figures on display. And kids will love using their imaginations for those wild adventures. The Minecraft zombie toy has the great benefit of being a well-established enemy within the Minecraft universe. His role or job is to attack Steve (the character you play as in the game) during the night. And sometimes day, if you happen to be in a dark spot like a cave. Because as I mentioned earlier, zombies burn in the daylight. Steve has to think fast and light up his surrounding areas in order to save himself from a zombie invasion. Placing light around your base is the best way to keep zombies from ganging up on you. I love this idea for setting up Minecraft display pieces. And if you decide to collect all of the Minecraft Core figures, you’ll have plenty of accessories for display along with the figures. How you choose to set up your figures or play with them is up to you. I just love taking a look at these particular ideas because it’s a big part for me as a collector. In fact, I love looking at others displays to see how they did it. It’s inspiring for me to see how well people organize and set up their collections! Another use for this action figure is one you might not think of. If you’re having a birthday party for a Minecraft fan you may want to use this as a Minecraft cake topper. It’s the perfect size to sit on top of the cake (only 3 inches tall). It’s very light weight too! The bonus is you get to keep it as a gift afterward. Pretty awesome! Speaking of setting up collections, some collectors will find the box very important! And while I do love an awesome display box, I like to take the figures out. Nevertheless, the box for the core zombie figure is exactly what you’d expect for a kids toy. The box features the look of a grass block and it has a plastic casing that holds the figure in place. It also has a picture of Steve and the Minecraft logo, nothing too fancy. The back of the box features some information on the zombie like the fact that he burns in sunlight. It also shows more Minecraft series 1 figures. Not too shabby. I think it looks very official. After all, it has the Mojang logo (creators of the game) too. The hook the box hangs on in the stores is also cuboid just like Minecraft. Great attention to detail there. Unfortunately, you can’t reuse the box after you open it. It’s a problem with all of the toys that don’t come in a proper box. Once you open it the only way you could reuse it is if you glue it back together. Still, I like the look of it. I just wish you could re-seal it once you’ve ripped it open. It’s a little bit disappointing but, pretty much standard for these toys. Although he’s heralded as an action figure, he comes with just a little bit of movement which is very similar to the in-game Minecraft zombie. You can move his legs back and forth but, not to the sides. The same type of deal with the arms. The head itself is actually on a little peg so you can twist it side to side or pull it off entirely if he needs to lose his head in a battle. While I didn’t think zombies were too adept at wielding weapons, the Minecraft zombies definitely can. I’ve learned that the hard way when I was attacked by one. They like to pick up whatever weapons they find laying around. So, a sword is an acceptable accessory. He can even wield it just like in-game since his hands are open and you can pop the sword in with ease. And while zombies are on their travels around the world, they carry an iron block with them. Zombies in Minecraft tend to drop iron as well as rotten flesh. As for myself, I’m glad they didn’t include the rotten flesh as an accessory. Ew! So yes, indeed, they do come with an iron ore block too. Which makes for the perfect stand to display him on. There’s nothing more disappointing than a figure that can’t stand up on its own. Luckily we don’t have that problem with this Minecraft core zombie. And while he can fall over pretty easily since he’s a little top heavy, it works well enough for me. There are even more brand new figurines in the core series. That’s a feature that makes this toy very collectible. The zombie happens to be a series one figure. The other series one figures are a creeper, an enderman, and Steve. The series 2 figures introduce the newer characters like the iron golem or the blacksmith. Finally, series 3 has characters like the pigman, the witch, and a charged creeper. Each includes their own accessories. It’s so easy to jump into collecting these toys with them being some of the most popular figures they’re easy to find. And their low cost makes them very economical to collect! Of all the Minecraft toys zombie fans like, the core zombie action figure is a classic. It will provide you with hours of fun whether you are a collector or if you just want to play with awesome figurines. It’s well made, and very sturdy so it can make it through hours and hours of play. It may not be doing anything new in terms of action figure but, it’s faithfulness and commitment to the in-game character is what makes it stand out above other Minecraft zombie action figures. Buy the Minecraft core zombie figure on Amazon here. Zombies are always so terrifying. They creep towards you slowly. They stare at you menacingly with their cold uncaring eyes. And don’t get me started on the moaning. But now? Now, there’s no need to be afraid. You don’t have to hide or run. You’ll want to hug this guy every chance you get. And maybe he’ll put in a good word with his friends so you won’t get attacked anymore. No one can resist the cuteness of the 12″ Minecraft plush zombie. I know we’ve all learned that zombies are dangerous but, you’ll be too preoccupied with how squishy, soft, and adorable he is to really care. He’s a happy little feller. And this one doesn’t burn in the sunlight. Want another fantastic plush? Check out the enderman plush toy! What does he do?/What can you do with him? This fantastically fun toy is a plush, so he doesn’t have any hidden features or special abilities like some of the action figures do. But, that doesn’t take away from its greatness. The fact that it’s a plush is the main feature. He’s soft, cute, cuddly, and adorable. All of the greatest features you’d want for a kids toy. It’s durable too. He can survive all of those adventures and journeys kids want to take him on. And for collectors, he comes in a nice box! The box is better than what you would expect for a plush toy. A lot of plushies just come on a hanger, but we have a great box for this one. It’s an open-faced box so no plastic guarding the plush. But, the box itself is stylized, looks official and clean, and it shows off the toy well. What do I mean by stylized? A lot of boxes have straight edges to them when displaying a toy. It’s just a box with a window cut into display the toy. Nothing fancy about the presentation. But this box, in particular, has carefully cut edges, so the sides weave in and out with a crisp, clean cut cuboid pattern. It imitates the look of Minecraft. I love that. And for those of you who pay close attention. On the inside of the box, it’s dark with stars and a moon painted on. And why is it like that? So the zombie doesn’t get burned obviously! We all know the zombies from Minecraft burn in the sunlight. It’s such a small touch but it goes the extra mile to show that they put care and effort into the display as a whole. All of that said, the box is made out of your standard cardboard. So with no plastic shielding and open edges, it tends to get bent up a little bit easier. Which is unfortunate but, I still love this box. 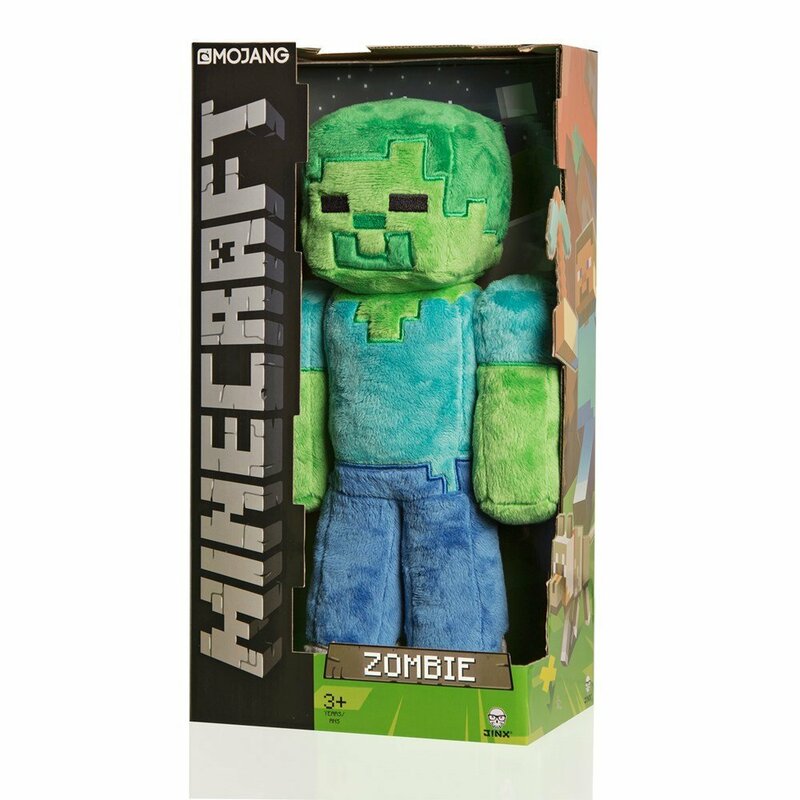 While there are plenty of other Minecraft plushies in the mix, there aren’t many that come in a similar box to the zombie. The only other one right now is the Zombie Pigman which is also a 12-inch plush toy. The other plushies have their own different boxes. Like the Spider, Iron Golem, and Ghast that have their own box. And the Mooshroom, Pig, and Ocelot have their animal box. Each of the Minecraft plushies is made with soft, durable, and quality materials which make them fit together well as part of a collection. So, while the boxes aren’t the same I would highly recommend them for collecting. These plushies can be more difficult to display due to their size. They aren’t huge toys but, it’s not quite like collecting a 3-6″ action figure. The zombie is 12″ so you will need some room if you’re planning on making a bigger collection. For myself, I like to arrange the plush toys just like you would pillows with the larger ones at the back and put the smaller ones around it. The Minecraft stuffed zombie from J!NX is fantastic for younger Minecraft fans. It’s soft and durable, made with great materials, and so cute you’ll never stop hugging it. It looks exactly like those scary zombies straight from Minecraft. There’s no need to fear the night anymore, embrace it to keep your new friend safe from the hot sun. For fans of Minecraft, this is one of those I gotta have it plush toys.